SpaceShipTwo pilot Peter Siebold parachutes to Earth after the space plane broke apart during a test flight on Oct. 31, 2014, killing copilot Michael Alsbury. It is a picture of bravery in the face of the unthinkable. A newly released photo by Virgin Galactic that shows a test pilot managing to parachute to safety after the tragic SpaceShipTwo crash last year is a moving reminder of the risks and resilience that have helped humanity push its way out into space. 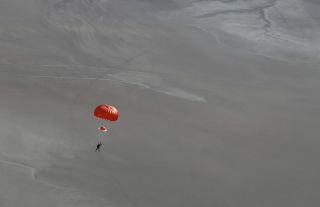 The photo shows SpaceShipTwo pilot Peter Siebold floating back to Earth via parachute on Oct. 31, just moments after the vehicle broke apart in a test-flight disaster that killed co-pilot Michael Alsbury. The accident occurred because Alsbury unlocked the space plane's re-entry system too early, leading to the crash over California's Mojave Desert, National Transportation Safety Board (NTSB) investigators announced Tuesday (July 28). In the image, a seriously injured Siebold is suspended beneath a red parachute, which provides a splash of vivid color against the gray-brown desert. The photo was taken from above, apparently from an aircraft, by Virgin Galactic photographer Mark Greenberg. Scaled Composites test pilots Peter Siebold (left) and Michael Alsbury were flying Virgin Galactic's first SpaceShipTwo when it broke apart and crashed over California's Mojave Desert on Oct. 31, 2014. Alsbury was killed in the crash, which seriously injured Siebold. At the time of the crash, Siebold was serving as Director of Flight Operations at Scaled Composites, the aerospace company that built SpaceShipTwo for Virgin Galactic. He and Alsbury were experienced, veteran test pilots for the company. Siebold survived the SpaceShipTwo crash because his seat was ejected from the vehicle as the spacecraft broke apart. He was then able to unbuckle from the seat, allowing his parachute to deploy automatically, NTSB investigators have said. On Tuesday, the NTSB presented the results of its nine-month investigation into the SpaceShipTwo crash, with investigators stressing that Scaled Composits and Virgin Galactic have already developed a mechanism that will prevent the craft's "feathering" tail boom re-entry system from unlocking early. "As part of our constant and continuing efforts to enhance our processes, we have already made changes in the wake of the accident to further enhance safety. We will continue to look for additional ways to do so," Scaled representatives said in a statement Tuesday. "We extensively supported the NTSB's investigation and appreciate all of its work to make the industry safer. Mike Alsbury exemplified the passion that all our employees share. He and his family are always in our thoughts, and they are especially so today." "Every new transformative technology requires risk, and we have seen the tragic and brave sacrifice of Mike and the recovery of injured surviving pilot Pete Siebold," Branson said in a video and in the blog post. "Their tremendous efforts are not in vain and will serve to strengthen our resolve to make big dreams come true." SpaceShipTwo is designed to be carried to an altitude of about 50,000 feet (15,000 meters) by an aircraft called WhiteKnightTwo. The space plane is then dropped, and its onboard rocket engines kick on, blasting the vehicle up to suborbital space. Passengers who buy a ticket — the seat price is currently $250,000 — will experience a few minutes of weightlessness and be able to see Earth against the blackness of space before SpaceShipTwo glides home for a runway landing, Virgin Galactic representatives say. That's the way things will work when SpaceShipTwo is up and running, anyway. The vehicle is still in the test phase; the Oct. 31 crash occurred during SpaceShipTwo's fourth rocket-powered test flight and 55th test flight overall.